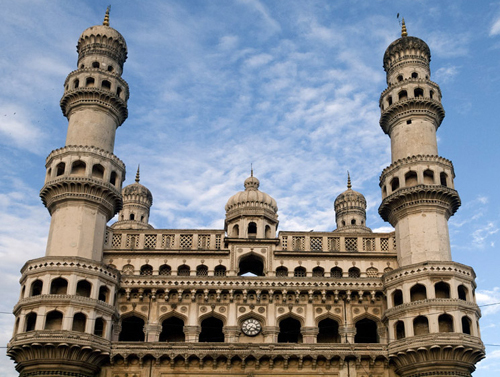 Popularly known as ‘City of Nizams’, Hyderabad was established in 1591. Hyderabad was historically known as a pearl and diamond trading centre, and it continues to be known as the City of Pearls. It is situated along the banks of ‘Musi River’in the Deccan Plateau’s northern part. It is fourth most populous city with a population of about 7.75 million people and sixth most populous urban agglomeration in India. Telugu film Industry, famously known as Tollywood, is the second biggest film industry in India, is based in Hyderabad with an annual turnover of about 250 million dollars. The industry produces around 150 to 200 movies every year. There are some best places to visit in Hyderabad for sightseeing & attraction. The city is also famous for sightseeing and tourist attractions including the lakes popularly referred to as Sagar. Most popular among this lakes is the Hussain Sagar, popularly recognized by the United Nations World Tourism Organization (UNWTO) as ‘Heart of the World’. The lake is spread across a humongous area of 5.7 square kilometers which has its water supplied by Musi River. Another famous attraction around the lake is the ’Buddha Statue’, which is the tallest monolithic statue of Gautama Buddha in the world. The statue was consecrated by his holiness, Dalai Lama the 14th by performing a ritual in the year 2006. Other famous artificial lakes created by dams on the Musi are Osman Sagar and Himayat Sagar. As of 1996, the city had 140 lakes and 834 water tanks (ponds). The Eastern part of the city hosts many defense research centers. One of the best places to visit in Hyderabad is ‘The Ramoji Film City’, which holds The Guiness World Record for being the largest Film Studio Complex in the world for being spread in a massive area of about 1,666 acres. The city often gets called as ‘Cyberabad’ owing to the boom of IT industry. Numerous biggies of IT have their offices in Hyderabad including Apple, Microsoft, Amazon and Facebook to name a few. The ‘Cyberabad’ area is located in the southwest and west of the city along with many bio-pharmaceutical companies and the Kasu Brahmananda Reddy National Park. The Charminar, Golconda fort and the Qutb Shahi tombs are considered to be monument s of national importance in India. The Chowmahalla Palace is the oldest surviving examples of Nizam architecture in Hyderabad. Falaknuma Palace (meaning ‘Mirror of the Sky’ in Urdu) spread across an area of 32-acre, was a private property of the Nizam family. And was converted and opened as a Hotel in November 2010. Among other best places to visit in Hyderabad include Purani Haveli, King Kothi and Bella Vista Palace all of which were built in the 19th century. Other landmarks are Paigah Palace, Asman Garh Palace, Basheer Bagh Palace, Errum Manzil and the Spanish Mosque.Rashtrapati Nilayam, a 16-room estate spread on an a 90 acres is a seasonal residence of President of India. The Presidential office is shifted to Hyderabad for about a month every year, a practice followed since 1956. This shift of base is mostly during winter. The Cuisine of Hyderabad is world famous for its unique blend of Arab and Mughlai cooking styles. Mainly comprising of Rice and Wheat oriented dishes along with intricate delicacies prepared from meat dishes assures a mouth watering experience. Hyderabadi Biryani, a dish prepared from Basmati Rice along with Meat or Chicken is undoubtedly the most famous dish of all. The tourism department show’s foreign tourist arrivals rising to 1,48,629 in 2016 thanks to the vast spread of hotels and tourism management. Hotels in City are available at ease with Frotels. Frotels provides variety of Luxurious as well as budget Hotels with customer friendly options of Full day as well as Hourly hotel booking for Transit or economic stays. Hyderabad lies at the junction of three National Highways linking it to six other states. The Rajiv Gandhi International Airport (RGIA) which holds a capacity of managing 12 million passengers and cargo of about 100,000 tonnes per annum, serves as the cities Airport. In 2011, ‘Airports Council International’ awarded the Airport as the world’s fifth best airport for service quality.